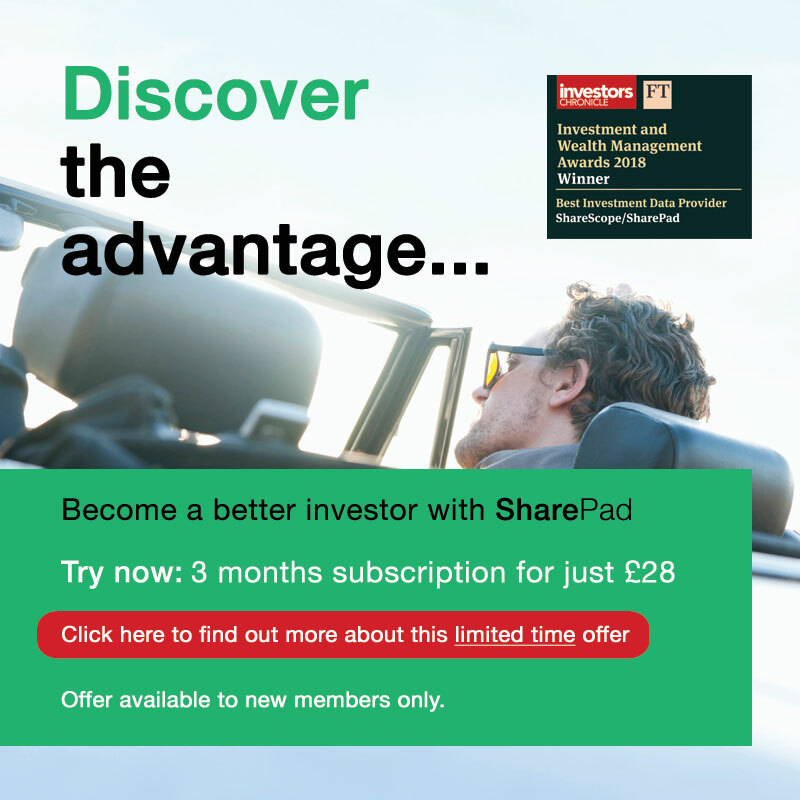 Richard Beddard investigates DotDigital in SharePad. The data indicates it has been very prosperous since it floated on the London Stock Exchange in 2011. A surge in investment suggests it intends to keep things that way. Apply a “Base Filter” to “All Shares” listed in London. I have described the Base Filter before, it excludes companies that just don’t interest me. Sort all the shares that pass the filter (currently 617) by the date they last published an annual report using my “Key Dates” list setting (you can add the “Prev Annual report” column to any list view to do this). Skip through the list from share to share using the spacebar. In the default two-pane configuration of SharePad, the green company-specific data in the right pane changes every time you jump to another company in the blue list view on the left. Look for businesses that have performed well in the past (and try to work out whether they will perform well in future). 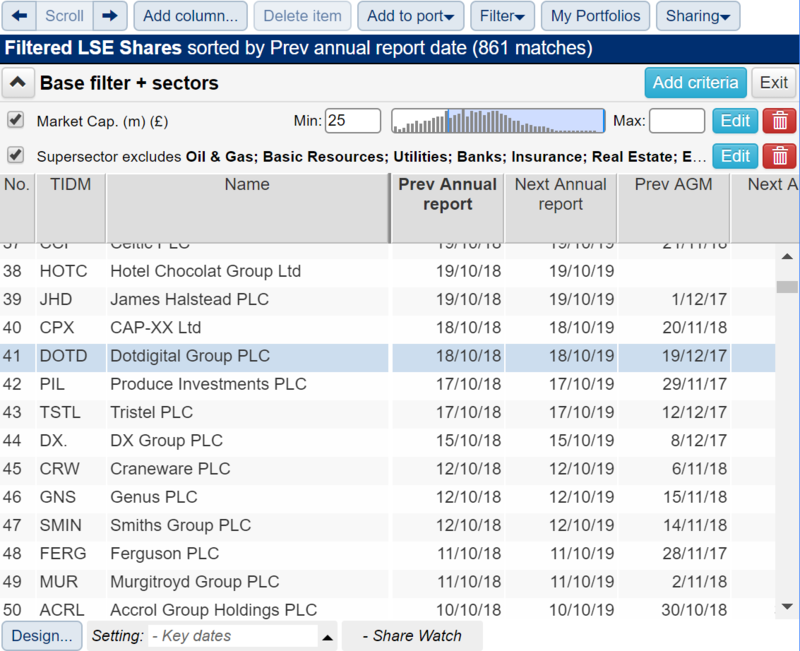 Glance at the summary section in SharePad and flick through the chart carousel at the bottom of the screen and you will see DotDigital earns a high return on capital, is growing revenue and profit rapidly, pays a small but growing dividend, and has no debt and a (generally) growing cash balance. These are signs of a company in rude health. So far I have resisted telling you what DotDigital does. Sometimes I think it is useful to see where the data leads us. DotDigital’s spending spree in 2018 is a big change. Focusing on this investment will be a good way of finding out where the business has come from, and where it is heading. SharePad’s “Company” information page tells us DotDigital is a marketing automation platform delivered as a service over the Internet. Its main product is dotmailer, which connects with business systems to create email marketing campaigns. Seventy eight percent of revenue comes from the UK, but it earns 12% of revenue in the United States, and has designs on the rest of the World. In November 2017, mid way through the year, DotDigital acquired Comapi, another British provider of software as a service. Comapi is not just, or even mainly, about email. 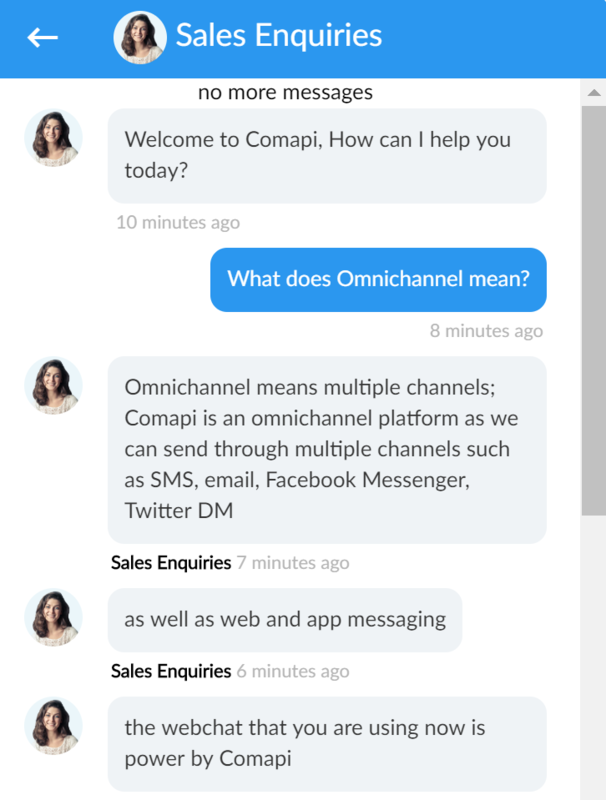 In a wide ranging conversation it also tells me Comapi focuses on “transactional messaging”, which sounds like sales, and allows two-way conversations with customers. I would like to ask whether she (or he) is the person in the picture, but fear the conversation is taking a stalkerish turn. 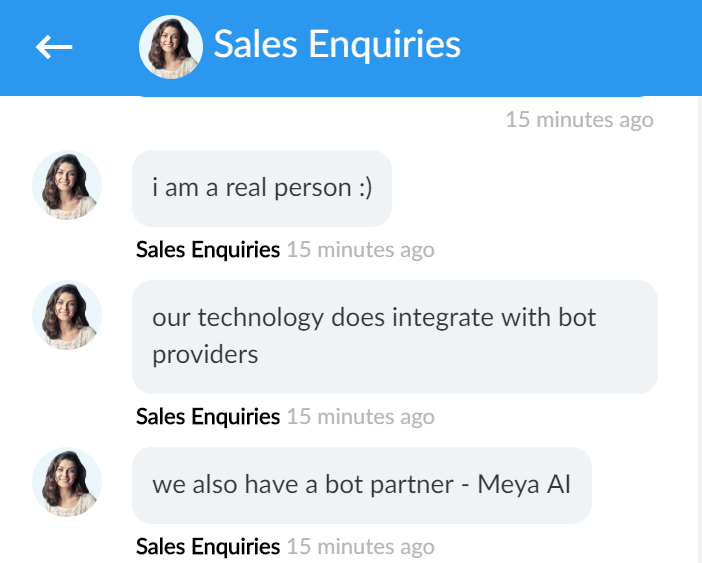 Apart from remembering not to make assumptions, I have learned quite a lot from our chat: an appreciation of what Comapi is, why DotDigital might want it, that it works, and if the bots are coming it is working on replacing humans too. Communication channels are proliferating so digital marketing platforms need to cover all bases. I am ill-qualified to judge whether Comapi will make DotDigital more competitive than other strategic options, acquiring another omnichannel provider or developing omnichannel capabilities itself, but I would also be inclined to trust managers that have not previously made splashy acquisitions, and who relegate them to a secondary position, behind organic growth, in the company’s strategy. On organic growth, we can tell from note 13 to the accounts that most of DotDigital’s internal investment was spent on intangible assets, as opposed to property, plant and equipment. It spent a little (£94,000) on other people’s software and a lot developing its own software (£4,377,000) in 2018. Much of this cost will be the salaries of software developers. Sometimes they are treated as an operating cost and deducted from profit, but companies can choose to treat the cost as an investment. If they do, the accounting is different. The investment is recognised on the balance sheet as an intangible asset and amortised over time, only reducing profit by a little each year. Companies that capitalise costs are saying they have developed a product that will earn revenues for many years, so charging all of the cost straight away will give a negative impression of the company’s profitability. To put it in more tangible terms, it is the same principle as a manufacturing company buying a machine that will turn out widgets for a decade, and depreciating the cost over the same period rather than charging it all in the first year. DotDigital is incorporating artificial intelligence and machine learning in its products and integrating them with ecommerce systems, both strategic objectives that should make it more competitive. But if the company is wrong in its assessment that substantial revenue will follow, it will have overstated profit. In 2018, DotDigital capitalised £4.4m of costs, but it only charged £1.9m of amortisation to profit. The difference, £2.5m, is more than the £1.5m increase in operating profit in the same year. Are the shares good value? Although DotDigital is a market leader in the UK, is growing rapidly and profitably overseas, and may be securing the future with its investments, the accounting judgements in the profit figure as well as the pace of technological change make me slightly nervous because we need to be very confident in the company’s prospects to invest today. 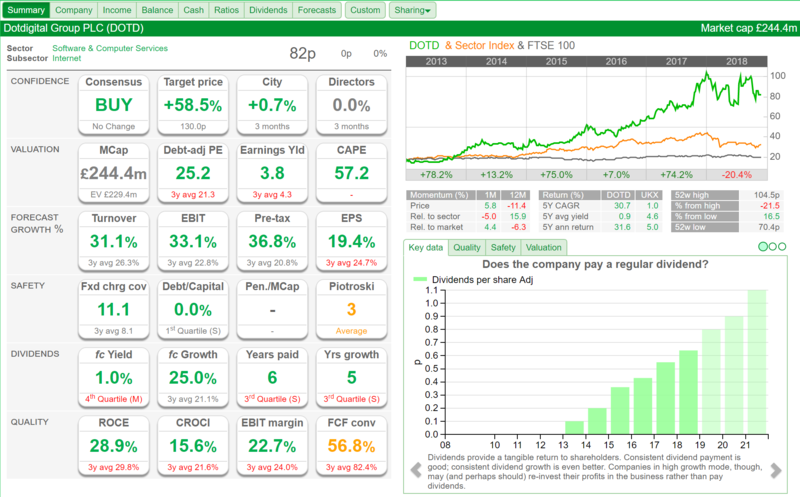 At the current share price DotDigital must grow impressively to justify the market’s valuation. 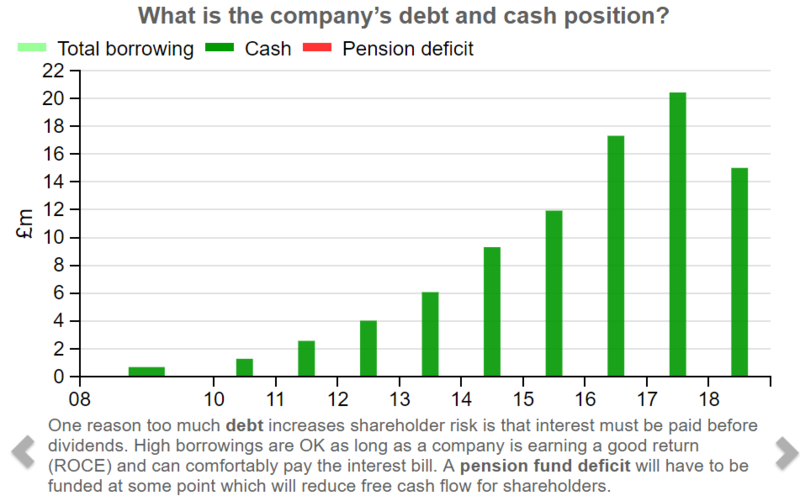 The share price values the enterprise at 25 times earnings on a debt-adjusted basis. The multiple’s reciprocal, 1/25 or 4%, is the earnings yield, the annual return we would get on our investment if the company were to pay all its profits to shareholders as dividends. 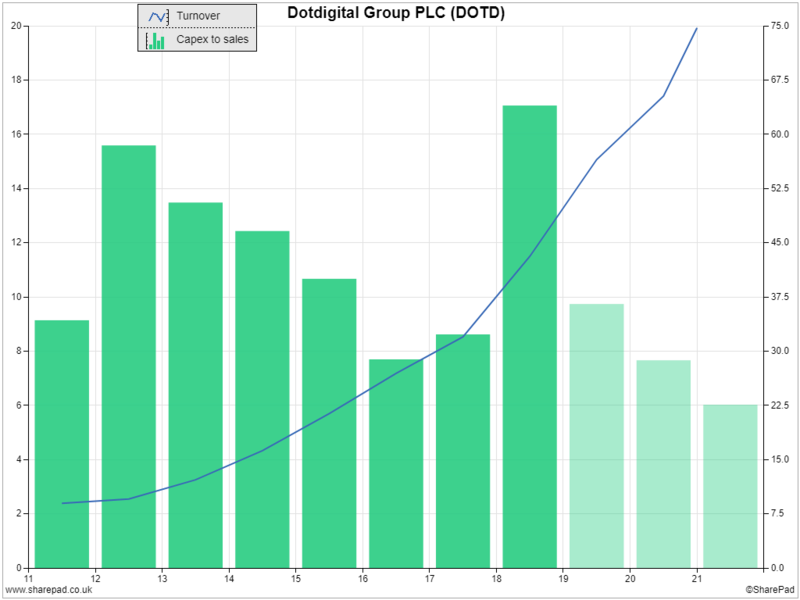 Based on current earnings, we are not getting much of a return on investment.